Near Emery Point, I pop off my bike at a seaweed strewn, sandy brown beach to watch dozens of Sanderlings devour flies and gnats at shore’s edge. Rhythmically attuned as a single organism, the frisky flock is dancing to and fro to the ebb and flow of gently lapping waves, hungrily stabbing at the receding waters' exposed sand with short stout black bills. 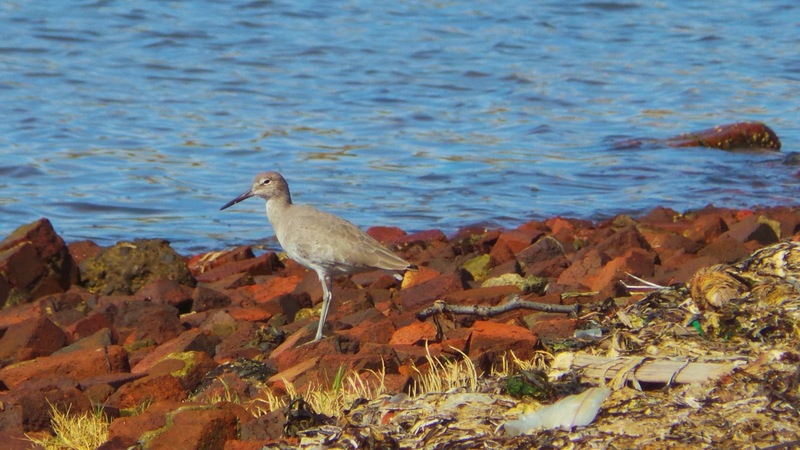 Then - an oblivious dog owner arrives and sets her pooch loose, creating panic and havoc as the small sandpipers lift up en masse and skitter away in a flurry of bleeping disapproval. Near busy University Avenue and Frontage Road, glistening mudflats attract hundreds of Gulls, Coots, Killdeers, Avocets, Willets, Whimbrels, Wigeons and Mallards, one and all convivially joining the “feast”-ivities of rich pickings upturned by roiling tidal action. Terns circle and dive bomb in the calm bay, surfacing with limp fish clutched in their beaks. Pole sitting Cormorants flash wings in garish displays of territorial bragging rights, or maybe they’re just airing things out. A troupe of Gray Pelicans flies overhead in graceful V-formation, much prettier air-borne birds than they appear in their awkward terra firma mien. 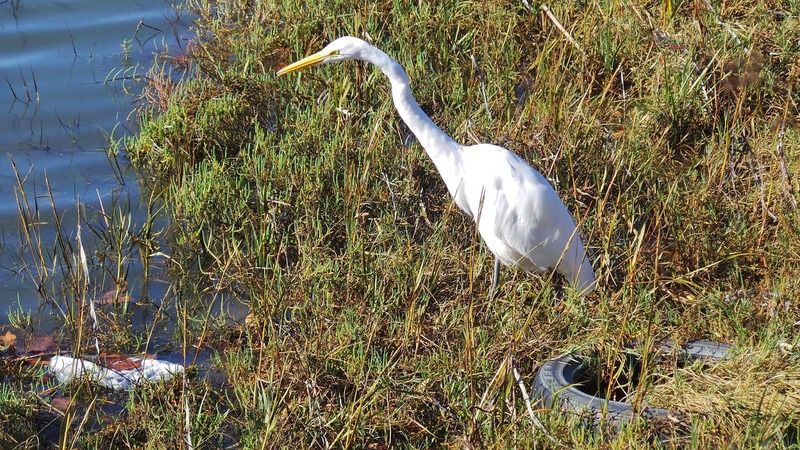 A motionless White Heron stalks near the freeway in stony silence next to a discarded old tire, hoping for a tasty meal of fish, frog or snake. I wait a full five minutes hoping to see the old boy strike, but the Heron remains laser focused on his phantom meal, a fixated and statuesque creature of the wild not a stone’s throw away from roaring six-lane I-80 traffic. 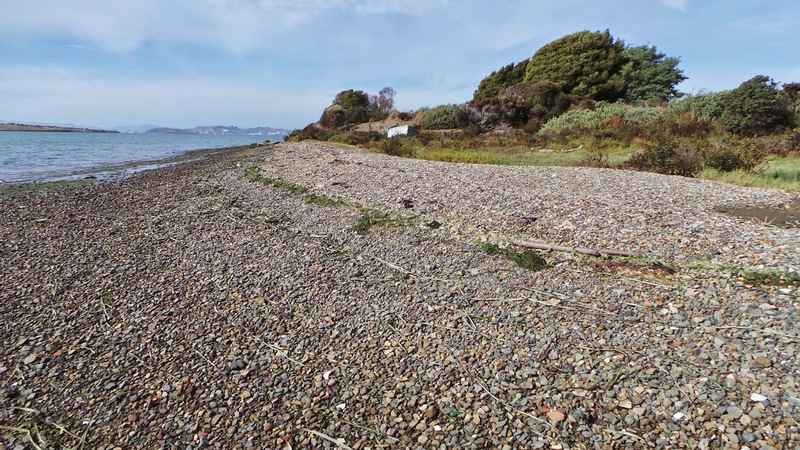 By now much of the Bay’s inner shoreline is laid bare, a tidal phenomenon exposing primordial mud-caked, provender-rich pasturage for hundreds of birds enjoying nature’s bounty of insects, worms and micro-organisms. 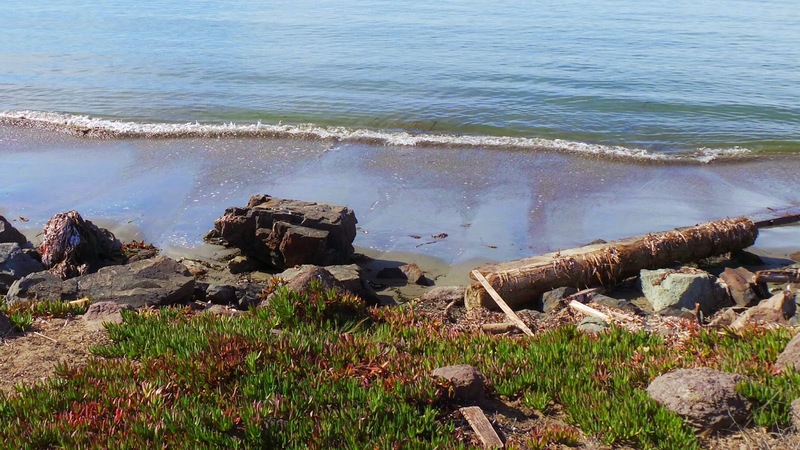 The outlet of three East Bay creeks converging here creates auspicious foraging grounds. When the tide's out, and conditions are right, an inconceivable 20,000 individual birds might be spotted in this rich habitat. Excited yet? 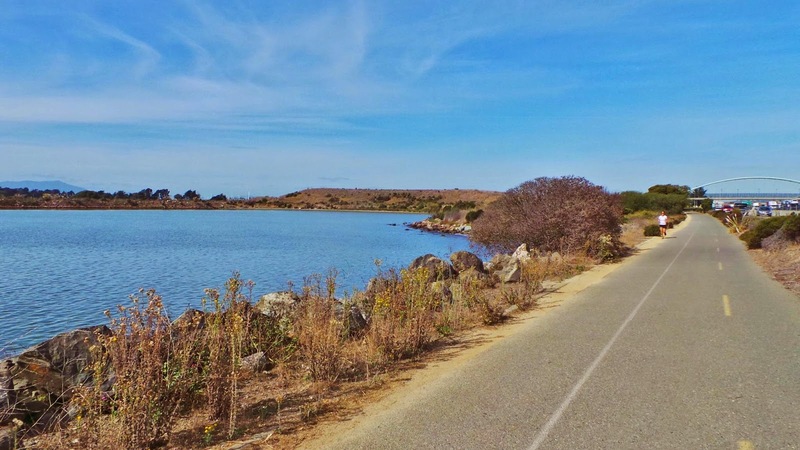 Well, maybe not – but choose your own adventure then, for options are unlimited along just one teensy, itty-bitty section of the envisioned 500 mile long San Francisco Bay Trail (67% completed). No matter what you do, the Trail is a ridiculously accessible nature magnet and great get away from the chaos and stress of urban living. It’s enjoyed daily, no matter the weather, by outdoor lovers and adventurists of all stripes - skaters, hikers, strollers, joggers, dog walkers, power walkers, kite fliers, fishermen, wildlife viewers, en plein air painters, and nature aficionados - room and more for everyone! Including, you’d think, birding enthusiasts, given such avian diversity. Today, though, I’m the only peculiar species out and about sporting binoculars and ticking off the birds – at least those I’m able to ID. 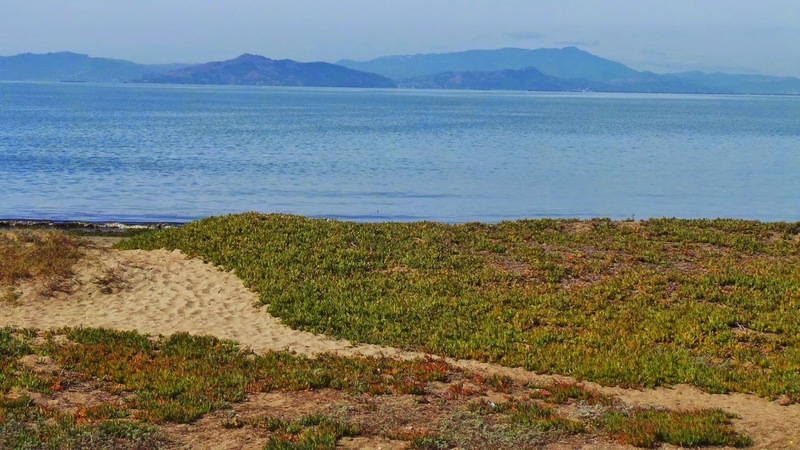 For views, history, recreation, and exemplary urban development in natural, sensitive areas, the San Francisco Bay Trail is nonpareil. Years of behind the scenes efforts by dedicated individuals have resulted in successful habitat reclamation up and down the Trail, providing foraging and breeding territory for coyotes foxes, deer, bobcats, skunk, raccoon, and many reptiles and amphibians. Notably, birds and native plants have struggled to regain a foothold in once endemic nooks and crannies of the long abused shoreline. Working with various land agencies and private entities over the years, trail architects have secured easements and connected disparate stretches to design a multi-use trail system passing through urban areas, reclaimed wetlands, marshes, swamps, and rehabilitated upland meadows. The ultimate goal - a contiguous 500 mile trail around the entire Bay Area – is within reach, an amazing accomplishment paying dividends to all. Millions of urbanites benefit from the healthy pleasures of a world-class mega-playground, and for hundreds of species of animals and birds an especially providential matrix of habitats has been preserved. 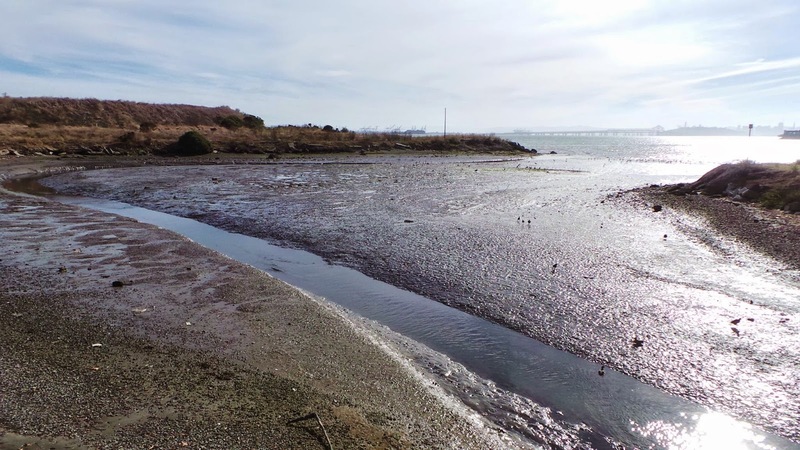 These vulnerable creatures’ literal existences in the highly industrial Bay Area depend on preserved and protected tracts of land - and lots of it - to thrive and survive. 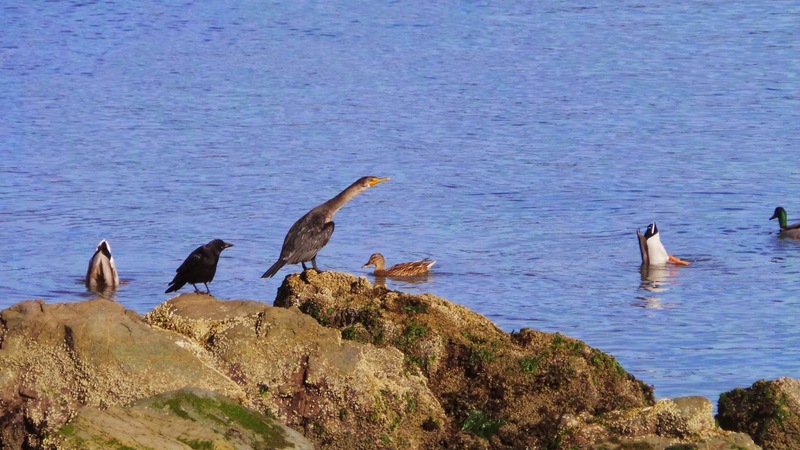 Despite set-backs and innumerable threats to their existence, by all measures, the birds are doing a great job thriving and surviving in the San Francisco Bay. Viva Aves! 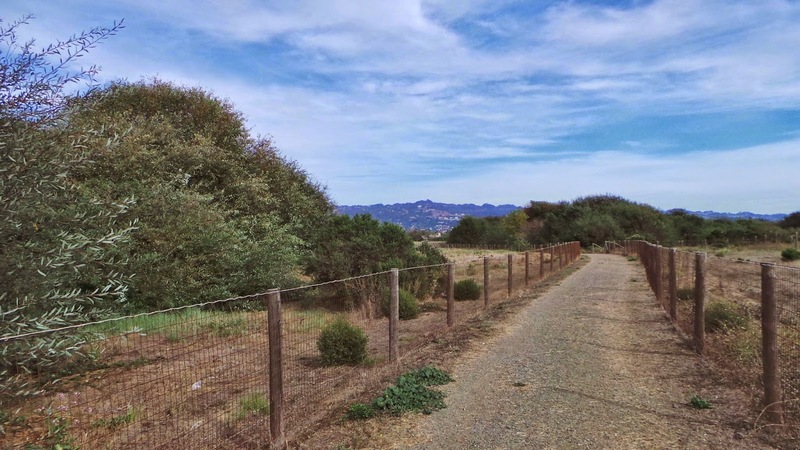 The stretch of trail from the Berkeley Marina Overpass south to Emery Point is a vivid contrast between gritty urban on one side, and beautiful nature on the other. 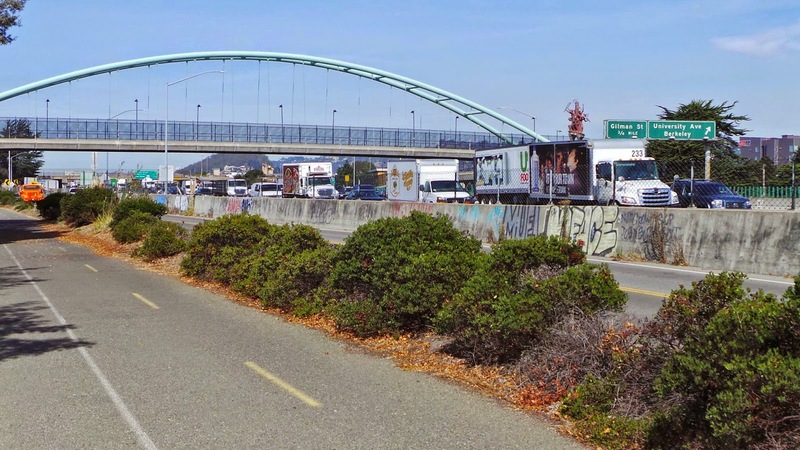 On one side, it's cringe-worthy big rig clogged traffic inching along the I-80 corridor with a horrendous backdrop of boxy warehouses and graffitied factories of West Berkeley. glimmering like a string of pearls in the sky beyond Treasure Island. The omnipresent awfulness of I-80 traffic, noise and urban sprawl ceases to exist, just so long as you can keep your neck craned westward the entire time in blissful contemplation of the vast, undulating domain of island, sky, sea, mountain, our Bay Area wild. At the Berkeley Brickyard area, I stop to see what it’s all about, what I did not know I had been missing all these years of never once having checked it out. Turns out, this little spit of landfill peninsula, slated for imminent development, blew my friggin’ mind! Graced with an accessible curvaceous shoreline, shallow waters, tidal mudflats and sandy stretches of pretty beachhead, for decades the area has been a go-to escape scene for the harried masses to wind down, amble slowly about, take things in, soak it all up. . .
. . .in a former dumping ground – a dumping ground! Concrete, rebar, and hundreds of eponymous red bricks litter the shore, but nature has reclaimed the rubble over the years, shifting and shaping and transforming industrial detritus into natural features of the landscape so that you hardly notice, it hardly matters. I feel a twinge of sadness at the inevitable changes to come. Why must anything be done with it atall? Why not just leave it alone? (Well, pardon my Pollyanna idealism.) But of course such places can’t remain wild and unutilized, got to coax max economic benefits out, right. 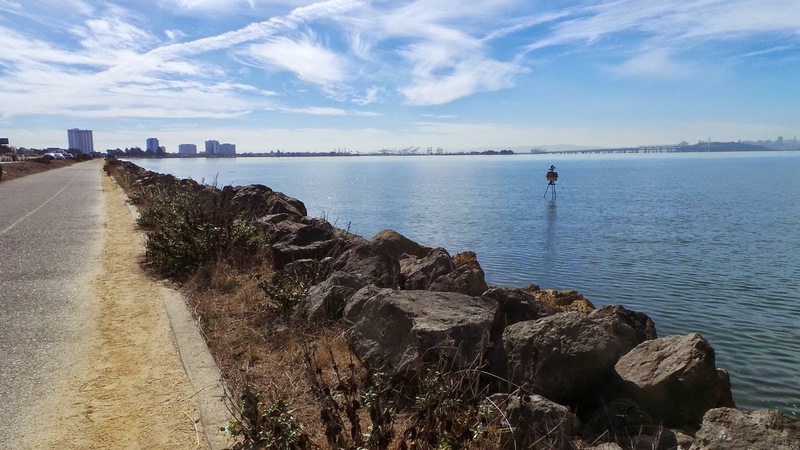 Thankfully, city planners assure us that development at the Brickyard will "make the waterfront part of Berkeley's vibrant urban community, attractive to and usable by Berkeleyans, neighboring bay area residents and other visitors." Let us hope so. Five million dollars are already earmarked for the design and restoration of the Berkeley Brickyard. Development is happening now, bulldozers are getting ready to smooth out the small rise whose wide vistas will soon be enjoyed from some second story Bay view restaurant window. Before long, the Brickyard Area, as it exists now, will be unrecognizable, cleaned up, prettified, made into a complex of tony shops and foodie joints, well-integrated with the natural elements, no doubt, but, I wonder, what is lost in the process. How many birds and amphibians and reptiles and mammals and invertebrates and arthropods and insects will be displaced. . .maybe not all that many, who's to say, except the developers, city planners, and environmental impact researchers. So, do tell! 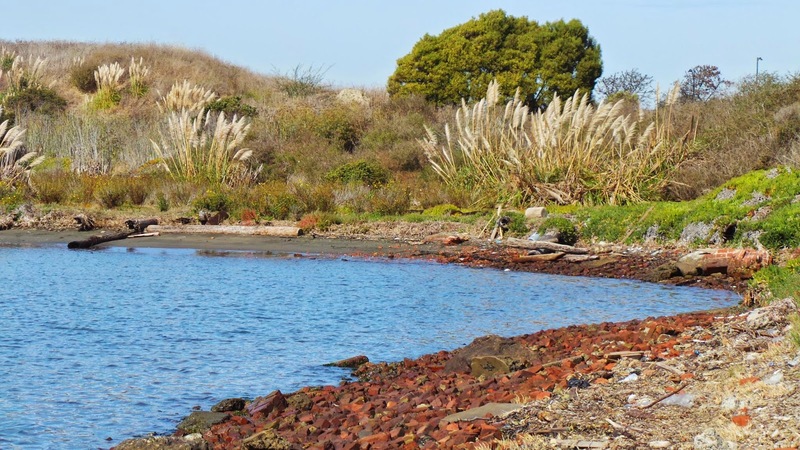 Opposite University Avenue and Frontage Road, an intriguing gateway exhibit welcomes visitors to explore a unique feature of California’s newest jewel, the 1854 acre McLaughlin Eastshore State Park. I’d never noticed the gateway before, and frankly, was only vaguely aware of the alliance between municipalities and other agencies to create the gorgeous park a few years ago that spans five cities along an 8.5 mile corridor of shoreline through the heavily urbanized Bay Area. A diorama commemorates the park’s namesake, co-founder of Save the Bay, Sylvia McLaughlin, and tells the story of a unique natural feature. 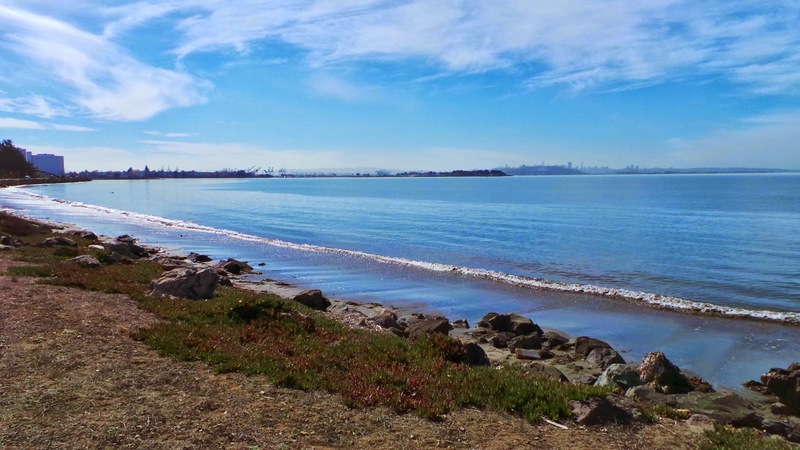 The San Francisco Bay Trail meanders through areas where coastline and meadow and marsh and brush and tree meet – our Bay Area - providing easy and instant access to the various environments found along the way. Always a field day waiting to happen. 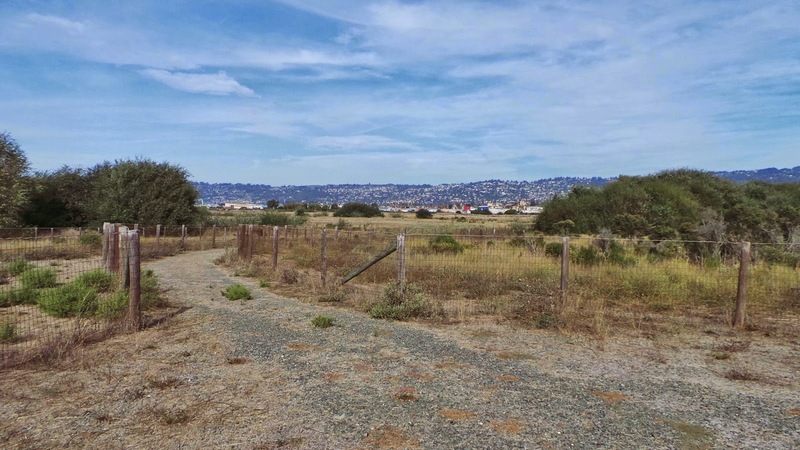 On the look-out, too, for evidence of Native American shell mounds and burial grounds, for much development along the East Bay shore was built on top of Ohlone sacred ground, sad as that is. Remembering a mural on the Ohlone Greenway bike path in Berkeley, a composite life of the Bay’s First Ones comes to mind - animal skin-clad nature animists tooling around in tule reed canoes, kinfolk gathering to shuck shellfish, others engaged in simple survival pursuits of hunting, gathering, harvesting, tending the hearth. A satisfying life in which every act was imbued with ritual power, every phase of life filled with cosmological significance, every relationship a sacred connection with all beings in the Universe. I love that you featured this gem of Berkeley. I used to run on that path (which is MUCH nicer now) on my Backroads lunch break! If I ever find myself stuck in that awful 80 traffic when I'm in town & have an extra moment, I'll pull off and just park and "crane my neck westward" fir that spectacular view. Nice to know I have a friend who does too! Great writing Tom! Lovely write-up. So inspiring that land can be reclaimed for all. And then be uninspiring that it be un-reclaimed for a privileged few.